In 1969 artist Andy Austin pitched herself as a substitute for an ABC TV courtroom sketch artist who didn't show up to cover the Chicago 7 trial, thus beginning her career of more than 40 years of covering some of the city's and the nation's most notorious trials--all documented in this compilation. Rule 53 dictates no cameras allowed in the courtroom, so mobsters, politicians, spies, terrorists, gang members, and serial killers on trial leave their mark on history through the artist's renderings. This engaging memoir and firsthand account of how the drama of the courtroom stage really unfolds will delight history and true crime buffs, court watchers, and anyone fascinated by the nuances of character only an artist can capture. In the late 1960s, new to Chicago and bored with the still life subjects she painted in her home studio, artist Andy Austin began wandering the city in search of surprises from life as it is really lived. Chicago delivered--with the color and drama of volatile times and larger-than-life subjects. The streets were alive with noisy demonstrations, against the war in Vietnam, and in support of issues ranging from civil rights to raises for schoolteachers. Austin sketched picket lines and protests and sometimes joined them, soaking up every detail with crystalline clarity. When she turned her skills to court drawing, her stunning ability to capture pivotal moments and revealing human interactions gave Chicagoans an unparalleled you-are-there view of trials and personalities that made headlines. 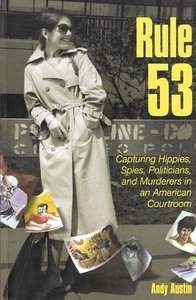 "Rule 53: Capturing Hippies, Spies, Politicians, and Murderers in an American Courtroom" is a vivid memoir by one of the country's best visual chroniclers of courtroom proceedings. Austin's gift for seeing essential details offers intimate glimpses of defendants like the Chicago 7 radicals, the Black Panthers and the El Rukns, serial killer John Wayne Gacy, and a parade of mobsters. In prose as deft and insightful as her sketches, she shares her portraits of the lawyers, judges, politicians, and others involved in cases she observed, salutes friends and colleagues, and shares personal experiences that influenced her unique perspective on local history in the making.